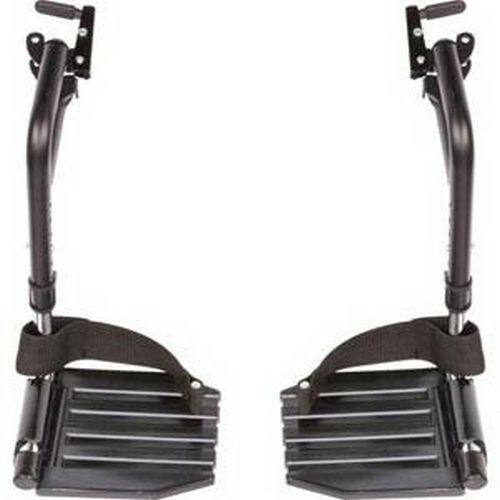 Swingaway Hemi Footrests with Heel Loop Footplate by Invacare is available in two type's of materials; aluminum - T93HAP and composite - T93HCP. Both materials make this foot plate durable and easy-to-clean. It is designed to fit all Invacare 9000 wheelchairs and the Tracer IV wheelchair. It has hemi footrests with a heel loop to keep the individuals feet from slipping off the rest. It has a swing away feature that not only allows for easy patient transfer, but it gives the chair user an easier way to get in and out of the chair. It features a 1-1/2" hanger pin spacing for standard wheelchairs.